Willie, a three year old donkey, stood outside the barn door at the farm he lived at in Mountain Grove, Ontario. “I’m waiting for the snowstorm to come,” said Willie. The donkey’s had so much fun playing outside that even Willie enjoyed himself. He had forgotten all about the snowstorm that was supposed to be coming. Dakota started running with all her might. Halfway to the fence, something in the sky caught her eye and she stopped dead in her tracks! Maggie and Nevada ran to catch up with Dakota and Willie and they ran up to the barn as fast as they could. Just as they stepped into the barn, the storm hit full force! Winter weather can be unpredictable. 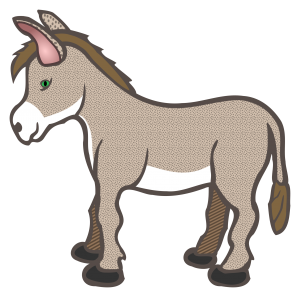 Example: Willie told the other donkey’s there was going to be a storm but they didn’t believe him. This entry was posted in Animal Stories, Grade 2 Level, Winter Stories and tagged barn, Dakota, donkey, donkeys, Maggie, Nevada, snowstorm, truth, Willie, winter weather. Bookmark the permalink.